Between my hacking cough and sounding like an 80-year-old chain smoker when I talk, I wasn’t the ideal candidate for work today. I’m sure my co-workers thank me. This meant I had some quiet time to think, so I started jotting down some ideas for the calendar/photo project I want to work on to raise funds for Bellingham’s homeless residents. First of all, I want to thank all of the people who either commented or emailed me after my original post last week with their ideas or general support. Many of your sentiments were deeply moving, and I appreciate how open your hearts are to helping those who are less fortunate. Secondly, I decided to name it the Life in Focus Project. If successful here in Bellingham, I thought – this idea may be worth expanding to help other populations in other areas as well. Now comes the hard part – research. I am starting to reach out to organizations, like Hope in Shadows in Vancouver, to find out how they organized their project. I won’t bore you with my entire project plan for this, but I’ll keep posting and occasionally ask for thoughts or maybe even assistance. We shall see! I’m excited to have so much support and look forward to making progress! Thank you Kim. People have been wonderful in giving me all kinds of advice and even offering to help out. I like the name of the planned project. Keep going! Love the photo, very nicely done. Great project name. It’s very fitting for what you are doing. This photo is a good start. Hope you feel better soon and let me know if I can help. I’m finally, finally feeling better, Emily. Thank you for the offer to help – I will let you know! I love this b&w photo. Something about a b&W image that speaks so well. I like you Life In Focus Idea. It will be interesting to follow your reports and to see if there is some way I could help out, even though Im across the states. Thank you, Heather. 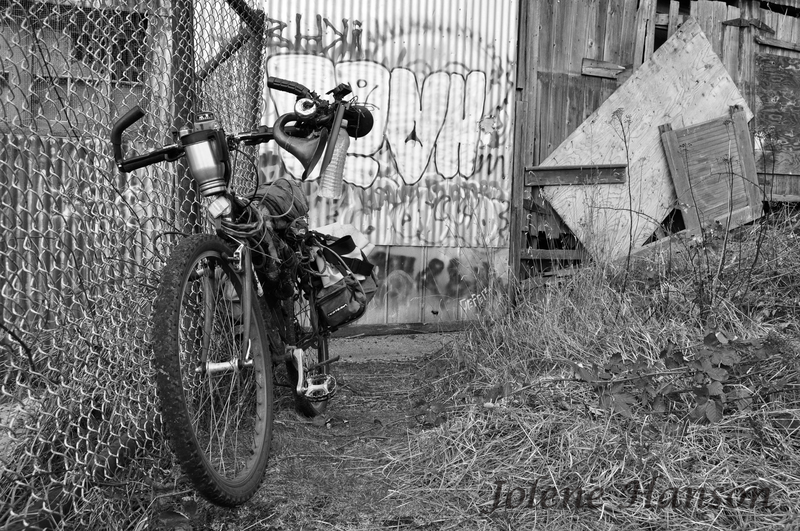 Funny story…I had to sneak through some thorn-covered weeds to get to this spot, and I was terrified that whoever belonged to the bike would get upset with me if they caught me. So, literally I snapped two pictures and took off. Luckily, one turned out. Although, there were so many interesting details on the bike that would have been nice to photograph. Sounds like a great project. Happy to assist if I you need something. And I like the photo. This is a really cool photo. Love that tone. Thank you, Nigel – it was my first experiment with B&W on the new Nikon. I’m pleased with how it turned out!